The North Carolina State Legislative Building has been home to the state legislature since 1963. Raymond Engineering was retained as the prime engineer for restoration of the building’s curtain wall system, masonry repairs, reconstruction of the promenade and planters and replacement of the five copper pyramid roofs and the ceiling restoration in the house chambers. The restoration of the curtain wall had the goals of making the system water tight while maintaining Edward Durell Stone’s, the buildings original architect, international style of prominent glass and concrete features. The restoration included the full removal of the 100 original bronze framed curtain wall openings from the promenade level, installation of a reinforced liquid waterproofing sill flashing, full replacement of the systems gaskets concrete eyebrow repair and coating at the second and third floor roofs, and full sealant replacement. Raymond Engineering also removed and reinstalled the landscaping withing the planters and all perimeter windows between the second and third floors to re-design window sill flashing. The low slop modified bitumen roof on the third floor needed to be replaced, and the waterproofing barrier of all the planters had to be removed and replaced. 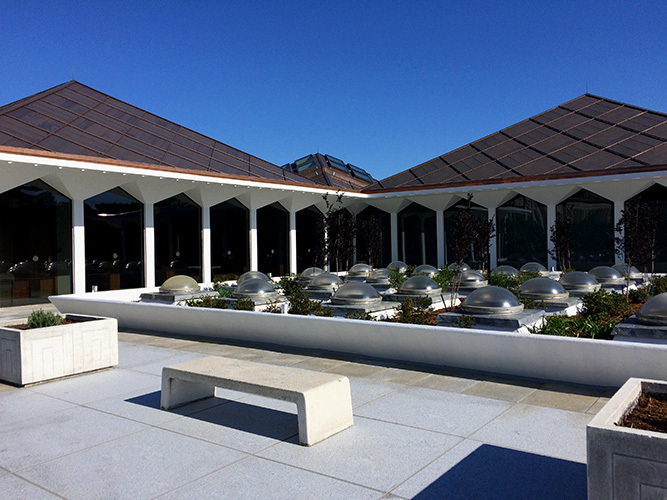 The second-floor promenade was restored, requiring the removal of all granite pavers, and installation of a new IRMA plaza deck roofing system. 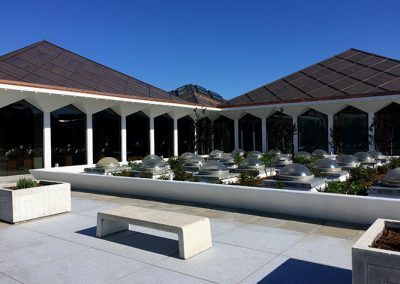 The building’s original Mount Airy white granite pavers were restored, cleaned, reinstalled to match the original layout and a new waterproofing system was installed. The buildings iconic copper clad pyramids and the flat roofs of the same level required interior asbestos abatement and were also restored. The design kept the original copper design qualities, however, the performance of the roofs was improved by adding a vented cavity and increasing the thermal insulation thickness. Work was also done on the skylights. 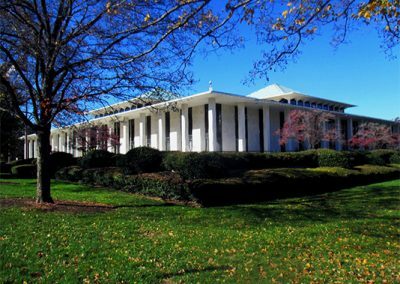 The project’s construction schedule was largely driven by the schedule of the State Legislature and required constant communication between Raymond Engineering, North Carolina State Construction Office, and The General Assembly to ensure no disruptions to the use of the building occur. Also, because the Legislative Building is open to the public every day, offers several daily tours, and is a field trip destination for many schools throughout the state, construction site safety was one of the highest priorities for this project.